I was so excited that I have been getting better at posting and then work happened. Instead of having occasional breaks throughout the day to write and clear my head, I was working late into the night. Fun huh? To top it off, I'm currently sick with a head cold. These are the days when junk food is desired and in some cases needed. This is one of those days. One option is a recipe I made last summer, Deep Fried Baked potatoes. If you have not noticed, I love deep frying stuff. This is probably why my weight loss efforts are not as successful as I hoped. Poke the potatoes with a fork to assist the cooking process. Cook for an hour depending how large the potatoes are. Once it is cooked, remove from the oven and let it cool until it is easy to handle. While you wait for the potatoes, chop the bacon into 1/2 inch slices. Then cook the bacon to the desired texture (crispy vs chewy). I cooked the bacon. Remove all of the meat of the potatoes into a large bowl. Add the butter, milk, 2 tsp of salt and 1 tsp of pepper. Mix until it becomes well incorporated. You should be able to form a ball from the dough. 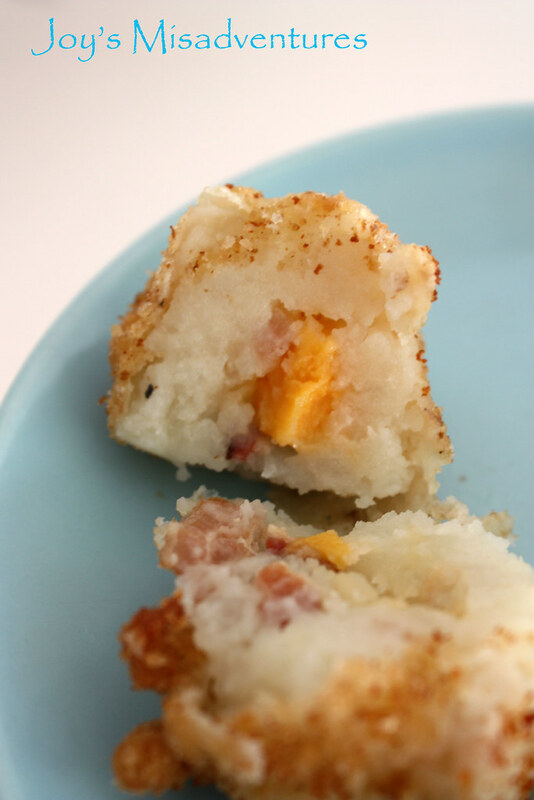 Take one piece of bacon and the amount of cheese you want (I went with 1/2 inch piece of cheese with a piece of bacon) and surround it with the potato mixture. It should make about 2 inch balls. Put it in the fridge for at least an hour or do this the night before and let it rest for over night. Heat a pot of oil of choice (I used vegetable oil) over med-high heat to 350F. You may want to check what temperature works best for the type of oil you are using. Season the panko with 1 tsp of salt and pepper. Setup your coating station starting with the flour, beaten eggs, and finally the season panko. Dip the potato balls into each of the stations starting with the flour. The panko should be the last station. Deep fry the balls until it becomes a golden brown. Drain on a paper towel to be remove the excess oil. Note: I used chunks of cheese, I would use shredded if you prefer melted cheese. 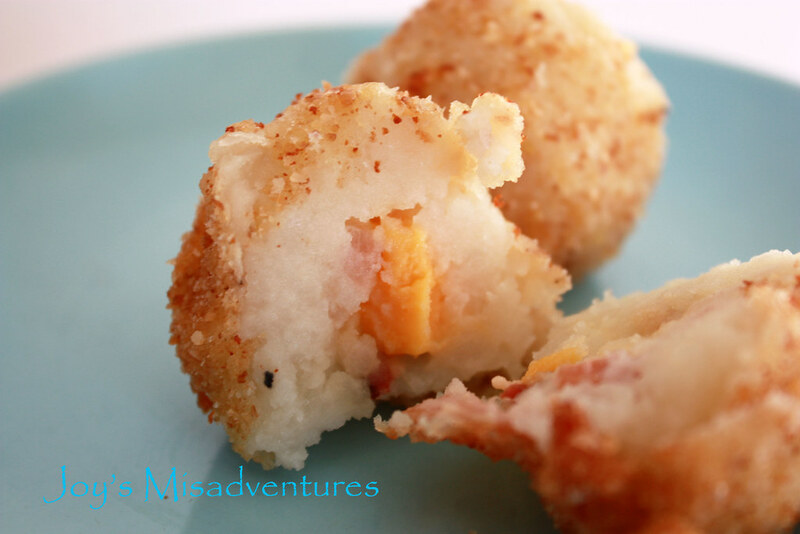 You will see the cheese melt better if you let the balls warm slightly verses deep frying them right out of the fridge. Dude! 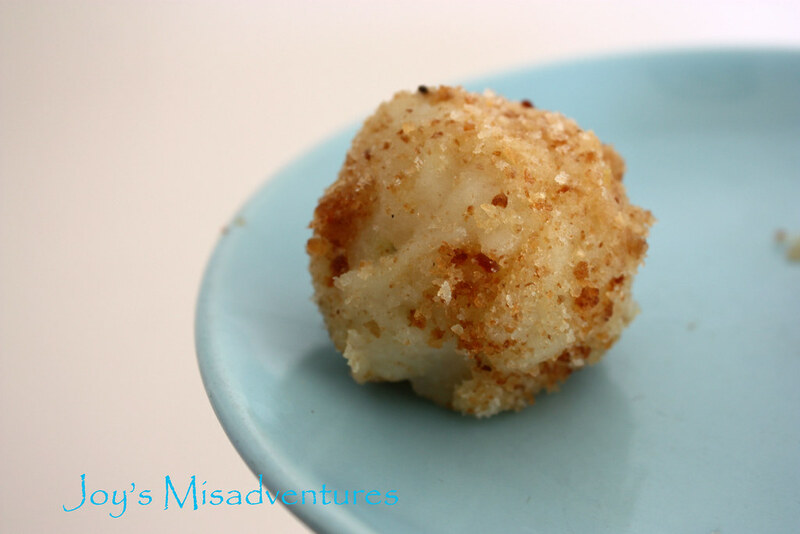 Deep fried mashed potatoes! Awesome, but definitely not on that new diet plan of yours :D Does bring up memories of that one dish at Trotters.....sigh. I wouldn't turn down this kind of junk food. They are certainly comforting and tasty.